“Can I just ask one question?” I asked her at the beginning of our time of solitude. “May I borrow your bike? I need to go somewhere, but it’s too far to walk.” Eager to reflect on the state of my spiritual journey and let go of whatever is holding me back from claiming God’s grace and living a whole and healthy life, I adjust the seat of Susan’s bike, put on my helmet and take off. As I ride, I sing to myself and to God. Celebrate your spirit and hold you as we pray. May you know there is love for one like you. I flash back to early that morning when I’m running along the West Arm of Grand Traverse Bay in northern Michigan, one of the most gorgeous places in God’s world. When I pass a sign on the left that says Villa Marquette, I notice several old white clapboard buildings with no apparent activity. I wonder. Then I glance to the right and see the sun directly aligned with a path through the woods to the water of West Bay. It’s as if the trail is on fire. I marvel and keep on going, but God beckons me to turn around. I run down the path to the bay, reach the shore and gasp. 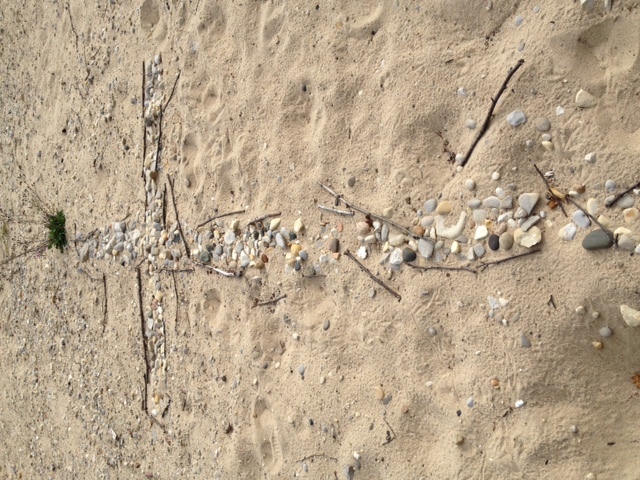 There, right in the sand, is a large cross made up of several hundred small stones and sticks for a border. Could the cross at the dock be connected with whoever uses Villa Marquette? Back in my room, I do some research and discover that Villa Marquette is a Jesuit Retreat Center where hundreds of priests from around the country gather for rest and relaxation in the summer along the shore of this beautiful bay. What a gift, for priests need rest and renewal as much as other clergy. Three hours later, I am back at this sacred spot on the bike. I walk through Villa Marquette, silent and empty, imagining what it must be like for priests to have a place to retreat. Then I cross the road and spend the next hour sitting on the dock, reflecting on our retreat theme of Jesus as the vine and we humans as the branches. Especially interested in spiritual disciplines as the basis for the pruning process, I begin a fearless self-examination. I remember the words of Richard Rohr, “A good journey begins where we are and being willing to go somewhere else.” Where have I been in my spiritual life, where am I now in my relationship with Jesus and how is God leading me into the future? I sense God calling me to rest, be patient and simply trust. I find the quiet center. 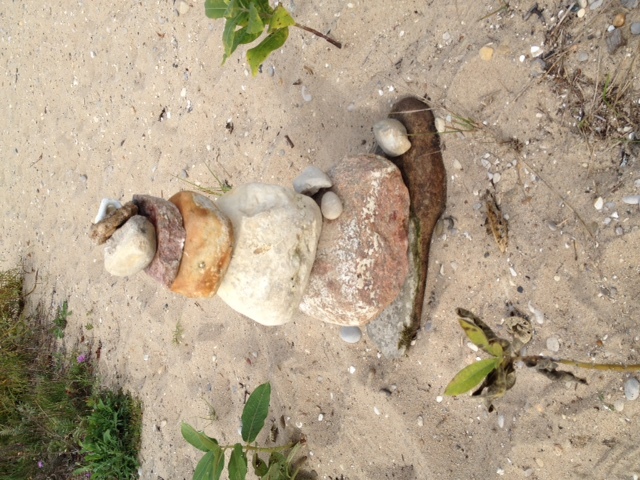 After tidying up the stone cross, I walk the shoreline and gather rocks to make a cairn. A cairn is a human-made stack of stones that often serves as a trail marker but can also have spiritual significance. Cairns have become for me a sign of God’s presence on the journey. I find a large flat rock as a foundation for my cairn, then add stones of varying shapes and sizes, including part of a ceramic door handle that has been polished by the wind and the waves. I find the perfect flat stone and am just about to place it near the top of the cairn when I suddenly realize that it’s likely a fossil. It looks like a brachiopod! 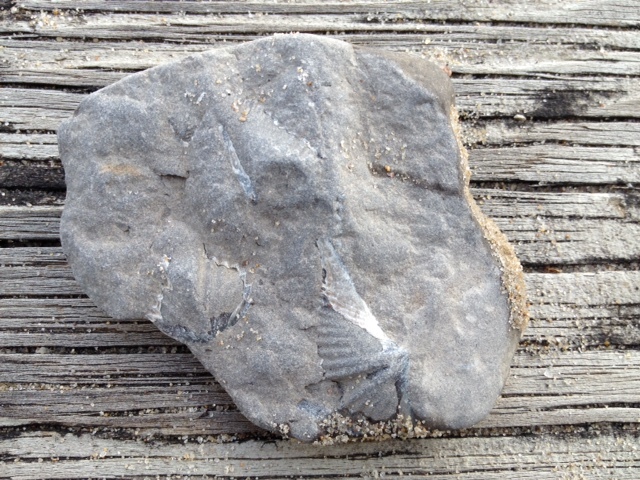 Sitting on the dock, holding the stone, I wonder why God directed me to this fossil. I am amazed at the mystery and majesty of God’s creation, that perhaps millions of years ago this brachiopod was a living marine animal. Holding the gift of the fossil, I am taken back to my childhood. What gave me life, joy and hope as an eleven-year-old? It was being outside, collecting rocks, leaves and fossils and exploring God’s world. I was turned on to geology by two sixth grade teachers who took us on summer field trips to the Pocono Mountains of Pennsylvania to collect fossils. As a result, I wanted to be a National Park Ranger as a kid. Even when I was in college, I took geology as one of only a handful of non-music courses. The gift of solitude is pure grace. To stand apart from my life, even if for only two hours, changes my perspective. Sitting on the dock of the bay, wasting time, I think about the churches I’ve served, the people who have graced me on my way and what the future holds. As I write, I contemplate the cover of my journal, a Paul Bond work of art called A Hymn to the Summer of My Long Ago. I acknowledge once again that nurturing our spiritual life is the foundation of the Christian faith. I gently put the fossil in my pocket, climb on my borrowed bike and ride back to my life. Thank you Laurie! Your words touched the heart of my longing soul. Laurie, you captured the very essence of Silence and Solitude and the resulting journey was a powerful witness! Our cups runneth over! Thank you for the reminder. I think I will put away my phone and go for a walk. 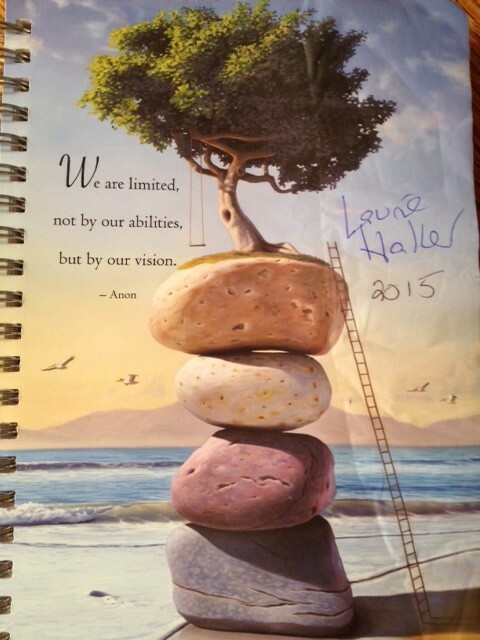 Thank you Laurie for your faithfulness in sharing your blog. This weeks message was a real confirmation for me take time to be silent before God. To ‘re energize so that we have something of value to give to others . There is beauty and strength in your message, Laurie.